We take a look at the seven most common types of expat and their motivations for moving abroad. With 3.1 million members in 420 cities around the world, InterNations is the largest global network of people who live and work abroad. In September, it releases the updated Expat Insider survey which identifies the seven most common types of expat. 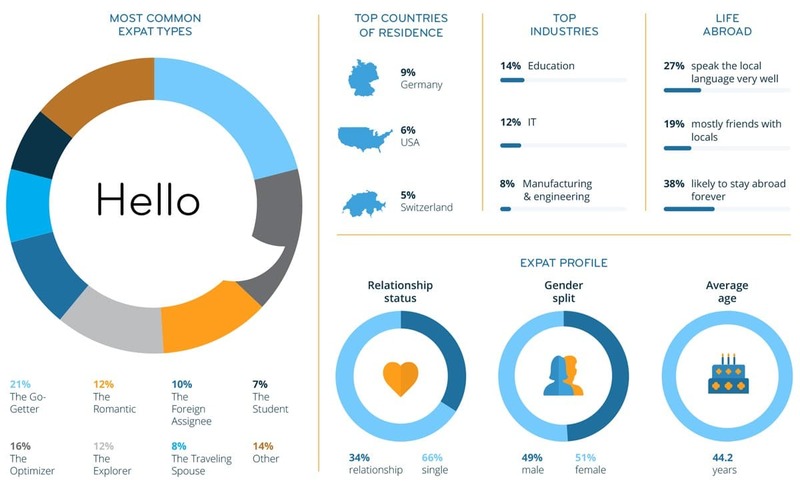 The survey polls more than 18,000 people representing 178 nationalities and living in 187 countries or territories and presents rich data on the expat experience including the seven most common motivations for moving abroad. Naturally, the seven categories are not 100% inclusive – there will always be people who don’t fit neatly into one – but considering the size of the survey, it is the most representative data we have. Go-Getters are likely to be highly educated and tend to move abroad to enhance their careers. Around 10% of Go- Getters hold a PhD, 45% hold a master’s and 33% a bachelor’s degree. In their new country, they mainly work in education (16%, including language education), IT including remote jobs (12%), and manufacturing and engineering (9%). Go-Getters work more hours per week (44.7) than the average expat (44). Putting work first has an impact on personal lives with almost a quarter of Go-Getters (24%) not living in the same country as their partners. This is twice the average (12%). Of all the types of expats, Optimizers see the most potential benefits of moving abroad, and it appears they are proved right: an above-average share of Optimizers are satisfied with the weather in their new country (74% vs. 61% globally) and the quality of environment (79% vs. 69% globally). Optimizers seem to find it easier to settle in, make friends in a new country and feel at home in the local culture. Enter the Explorer who is more likely to pursue a career as a digital nomad or to work remotely than other types of expat. Explorers seem to find it easier to settle into their new country, with almost three-quarters (73%) feeling at home (vs. 64% globally). A good work-life balance seems to be important to the Explorer. Explorers spend just 42.4 hours per week at work. Nearly seven in 10 (68%) are happy with their work-life balance (vs. 61% globally), which is – along with the Optimizer – the highest share among all types of expat. Although Romantics moved abroad for love, their romantic relationship did not necessarily last: 12% are currently single. Romantics appear to make more of an effort with language learning: 57% claim to speak the local language either fairly or very well. This may explain why the Romantic is most likely to have local friends: 38% which is twice the global share of 19%. With 12% of Romantics currently looking for work (vs. 8% globally), their careers do not look as successful as their private lives. Additionally, 34% are unsatisfied with their career compared with 25% of expats globally. Once the most commonplace type of expat, the Foreign Assignee has stepped aside as times have changed. Nearly every Foreign Assignee (96%) works full time and, with an average of 46.1 working hours per week, they spend by far the most time at work. This seems to pay off as 26% report an annual household income of over $150,000 USD, more than twice the global average (12%). Almost three in five Foreign Assignees (58%) think it is likely that they will return home at some point, which is the highest share out of all types of expat. This may explain why they find it harder to make local friends and tend not to learn the local language. The most gender imbalanced type of expat is the Travelling Spouse: almost nine in 10 Travelling Spouses (86%) are female. Due to moving for their partner’s sake, Travelling Spouses are more likely than other types of expat to take care of the home and/or children (27% vs. 5% worldwide) or to be currently looking for work (17% vs. 8% globally). Travelling Spouses also struggle with settling in abroad: 33% do not feel at home in the local culture. Moreover, 20% believe they will never feel at home there and find it hard to make new friends. The share of Students speaking the local language is the highest among all types of expat. Despite this, Students struggle to make local friends abroad. Unsurprisingly, with an average age of 32.4 they are by far the youngest type of expat (vs. a global average of 44.2). Less than half (46%) are in a committed relationship, which is the lowest share among all types of expat. Types of expat: Which one are you?